Have you ever tried combining the hearty taste of ground beef with the immense flavor of lamb sausage to create a kickin' burger?! Well, our good friend Diana has. She has been experimenting with various recipes using BF Farms grass-fed beef and lamb and we love it! Fall is here and the with the cool air upon us, it's the perfect time to grill or cook over a campfire. Gather your people - family, friends, neighbors - and try this super fun recipe! Combine ingredients in a medium sized bowl. The lamb sausage is spicy, so use less sausage if dining with sensitive pallets. Create burger patties and grill at the temperature that you prefer for a regular beef patty. Keep in mind, that lamb has better flavor when slightly under cooked. BF-Farms, LLC, Oklahoma's source for 100% grass-fed beef and lamb. 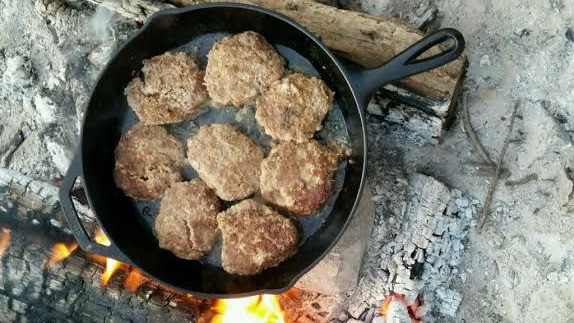 Posted on October 27, 2015 by Nicole Sallee and filed under Recipes, Healthy Living and tagged recipe burger grass-fed grass-fed beef grass-fed lamb grass-fed lamb sausage healthy farm BF Farms. We Offer Local, Grass-Finished Beef and Lamb. We agree to raise your beef or lamb on a 100% grass-finished diet without the use of steroids, antibiotics, or added hormones. Delivery from $17 per order in the Oklahoma City and Tulsa metropolitan areas. Not available outside of Oklahoma. Copyright © BF Farms, LLC 2015. All rights reserved.